We are having a torrent of rain today, from Tropical Storm Nicole. It has produced crazy road conditions, yet hours of fun for my children...they have enjoyed playing in the creek and running around getting soaking wet! It would be easy to try to manage my household, and keep it clean, by not allowing the children to get wet and muddy, but then they would lose priceless memories and fun, just because the house will get dirty. Houses can be cleaned! I want my children to have wonderful memories of their growing up years. It is not all play for my kids, they all work hard around here doing their schoolwork and helping with the garden and animals. They also must clean up their rooms, do dishes, vacuum...you know the stuff of life. It's a lovely crisp morning here. I have the door that leads to our deck open letting the coolness in. The sun is shining but it is supposed to rain again overnight. We are thankful to the Lord for the break in the rain - to move Kay and Kamryn more easily and so that Lindsay's riding students don't have to miss a day of lessons. At this time of year they know their lesson time is coming to an end when the weather turns colder. There is something about this time of year that appeals to my heart. After a very hot week, we have now cooled down to more seasonable temperatures and even rain, which is highly welcome after a terribly dry summer. Yesterday morning while preparing food for our church picnic, I asked Rachel to head to the garden to look for a few tomatoes to put in the salad. Tim and Kyle joined her and soon we had two bowlfuls of many varieties of little tomatoes...Sweet 100's, Riesentraube - German for "Big bunch of grapes", Tiny Tim....they have been delicious all summer and are still abundantly producing. And he dialed: DANton-ten-six----"Nurse," he said, "it's an appendix!" So it was for Madeline in the first of the books about Madeline by Ludwig Bemelmans, and so it is for Nate! It's an appendix! He was resting well when we left this evening. Pray as he recovers and will have to be out of work for a bit....his finances are very tight! Please pray for our son Nate. He called before 5 am this morning to ask me what might be going on with his stomach. He had been in pain since around 7:00 pm. We talked about it and then he called the doctor. They suggested that he go to the ER. Tim picked him up and drove him to the ER. They are doing a CAT scan to check his appendix. Please pray that they will find the cause. We had a storm last evening, but when Lindsay and I took the dogs out around 11:00 pm it had cleared and the nearly full moon was stunning. Tonight is the Harvest Moon...the full moon closest to the Autumnal Equinox and the fullest moon of the year. I hope you get a chance to go outside this evening and see it...it will be a beauty! My friend Karen's son Nigel asked me tonight what my dreams were when I was his age. I told him that I was living the dream that I had. I always wanted to be a wife and mother. I was interested in nursing and maybe being a teacher because I love children, and while I never went to school to become a nurse or a teacher, God has graciously granted me those things as well! I have a wonderful husband, and lovely family, a delightful home. In the day to day work of my life I teach my children, love my husband, cook, clean, take care of sickness and boo boos. I am now a grandma to the sweetest baby girl in the world! I have had the privilege of studying medicinal herbs, learning to garden, animal husbandry. I sew, I knit and crochet. I bake. I welcome people into my home on a weekly basis. I also am the president of a homeschool co-op. So you see God granted me the desires of my heart and then some! He gave me some dreams that I didn't even know I had! Monday night Emily and I went to a graduation meeting for homeschoolers. Tuesday we have appointments - Kyle at the dentist, Lindsay at physical therapy for her Achilles Tendon, and Emily has an interview for a job at Sight and Sound, and then works in the evening. Wednesday is riding lessons here and Emily is going to learn how to cut hair from a very kind lady who attends our church. Thursday is co-op, and I likely will do some grocery shopping as Friday is the fair. Friday is the Lampeter Fair Rodeo. The girls always compete in several events with our horse Sandy. You can read about last years rodeo here. He and his girlfriend have broken up. They do have their issues. Most of them are caused by immaturity and a lack of unity. I have never been in the position of being in a relationship like they have had...not married yet having a child. They both love her to pieces. My son has been working hard to provide for them. We wonder things like "Will we still get to see her" and "What will this look like?" We have grown to love Kayleigh. She is a part of our family. In many ways it is like a divorce. Why do people think that not being married will make everything easier? Where will they both live? Who will watch Kamryn while Kay goes to work? Kay and Nate we love you both and are praying for you more than ever. 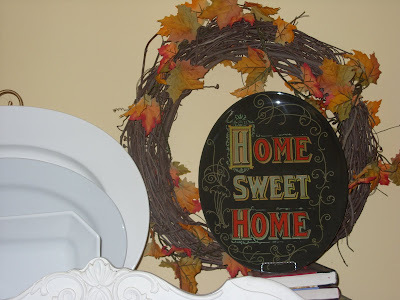 Home Keeping - Are We Thankful? The work of managing a home is never ending. It is daily tasks that must be done, to ensure a well functioning home. Some tasks are more pleasant to us than other tasks, depending on our personalities and interests. Years ago when my older children were small - so young in fact that several of my children weren't born yet, I had a hard time keeping up with everything. Partly it was because of not being organized and partly it was from laziness. I was home educating, and running my home, and doing a million other things. That was the problem, I believe...the million "other things." I didn't love my home then, the way I love it now. I wanted to always be going somewhere or "doing something." Isn't this lovely? I am blessed to have this photograph hanging on my living room wall. It is 8x10 right now but Lindsay had it enlarged for me, I just need to get the right mat and frame. This photograph was taken in Vermont last year. Yesterday she entered it in a local fair. We found out tonight that it won first place! It is so wonderful when you see your children using the gifts and skills the Lord has given them. I host a tea every year for my fellow home educating moms...last even about 10 came. It is always a lovely time of sharing and relaxing, getting to know someone new, catching up with someone you haven't seen for months. We sometimes have 30 ladies and other times only 5 have come...it doesn't matter. Whoever comes needed to be there and it is always thoroughly enjoyed. Spicy Holiday Tea, a variety of herbal and black teas, sweet scones, jam, mock Devonshire cream, lemon curd all homemade, with some mini quiches from Costco, and some purchased mini eclairs. I love how the ladies feel so pampered eating off of glass luncheon plates with real china tea cups! 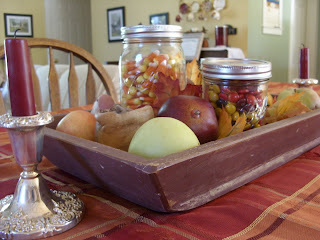 Soft candles burning, Autumn decor all around. Everything comfortable, casual, just right. Miss Kamryn came by for a visit on Saturday...her momma and daddy came too! Grandpa was busy with many things, but he finally had the chance to sit and hold her! She is smiley now and loves to 'talk'. She was sleepy when Uncle Kyle held her...I read his current favorite book, Big Red Barn by Margaret Wise Brown, to them both and she fell asleep in his arms! So sweet! Lindsay sprained her ankle Sunday night...it has happened about 5 times to the same ankle since she was about 12 years old...she stayed off of it most of the day. I found this beauty of a plate at Target! I spent more than I normally would for a plastic plate, but it is just so me and so perfect for my house, and it is a few weeks until my birthday, so I totally justified it! It sits on top of my hutch. I love it. 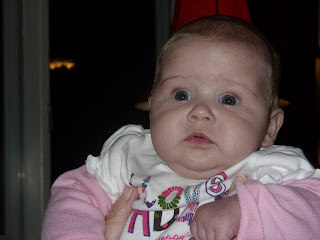 I did some sewing today and my granddaughter came for a visit as well....I am so blessed. 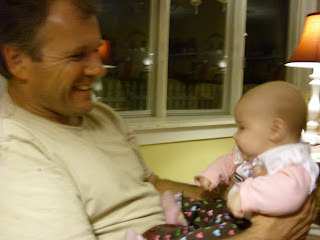 We had a lovely dinner altogether, lots of holding of Kamryn, the kids played...it was a Home Sweet Home kind of day. 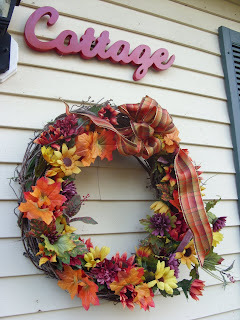 I am linking up with Melissa's 3rd Annual Fall Nesting Party! Click here to join the fun! Today is such a special day in for our friends. They have been fostering to adopt a young boy. He will be the third boy they have added to their family in this way. This little guy is 6, just lost a tooth, got glasses, and is very endearing. He and Kyle are great pals. On this day in history it will be remembered that the little guy legally became a member of their family! We are so proud to join them today at court and to celebrate with them! It touches me so deeply to see how this little guy's life has been changed by being brought into this family. I am reminded of how much my life changed by being brought into God's family, through adoption, too, and to be part of His family forever. By His Grace. It is this same Grace, that has brought this little boy to his new family, as well. Congratulations friends! We are so happy for you all! It is fun when you get to meet someone who you previously have only known through blogging. This happened this past July when we got to meet Karen and family from Blue Barn Bulletin. Yesterday I unexpectedly received a box. The kids were so excited to see what it might be. I saw the return address - "It's from Karen!" She had mentioned to me that she had some books she thought I would enjoy, and that she would send them to me, but I had completely forgotten! She sent me four books by Debra White Smith called the "The Jane Austen Series." They are modern re-tellings of some of Jane's most beloved works. I started the first one almost right away. I am enjoying "First Impressions", and stayed up too late reading last night. I had been looking for some light reading, and yesterday in the midst of my crazy and stressful life, a sweet and kind gift was dropped into my life! Also, I have to go to the church we meet in and sort through our co-op closet! Scary! But I am taking my crew and another gal from the group to help me! I think it will get done pretty quickly this way. I also have a busy week ahead; we will be attending a memorial service for a friends' father on Wednesday and then on Thursday our friends from Cozy Comforts have invited us to share their joyous day as they have the court finalize their adoption! We are very excited for them! We will be attending the whole proceeding and then going to lunch with them! Fun stuff! The weather this weekend was glorious! We wanted to be out in it as much as possible after weeks of such intense heat and humidity. We took a picnic lunch to a nearby state park we love and then spent some time looking at the river from the point. We met friends there for a while to celebrate a very nice young man's thirteenth birthday. We had to come home early because Tim is working this weekend. I made potato cheese soup for dinner, and had a lot left over. Today after a very nice church service, dear friends from church came over. I reheated the soup, Lindsay made a delicious salad and garlic bread. Emily made her famous ranch dressing and a veggie platter. Our guests brought drinks and snacks to share. It was fun and crazy last night. After picking up Lindsay and Emily from work, and dropping my little folk off at their favorite place "Camp Geezer", the girls and I rushed home to get ready to go. The Hospitality Lane gals, brought Grandma Georgia along (it was so fun having you with us, Georgia!) arrived and we finally left. The city was really crowded last night, could find a place to park on the street, Rachel's had a line out the door and enough people waiting to get in already, that we KNEW we would need to come another day. Becky mentioned a place near the college that she thought might be interesting, so we went there. This is where some of the fun and craziness happens. Lindsay and I don't drink coffee at all and I don't know about Becky, but we are all planning to have a good time. We are going to try to eat at Rachel's Cafe and Creperie, those Hospitality Lane gals have NEVER been there! I say try because it get crowded there, especially on First Friday. Then we will all go over to our good friend Denny's store - Fab Fashion. He has great designer style purses and jewelry, sunglasses etc...for fantastic prices. He is located near Central Market. After that, I don't know. But I am certain of one thing...the girls will think of something else to do! I have decided to not show you the poison ivy on my arm, neck, and face. It is sad. So I am only going to show you lovely things. I am now on a steroid cream and oral steroids. sigh....The Jewel Weed 'tea' Lindsay made and soaked her hands in worked very well...for her. For Rachel and I not so much. We are highly sensitive to skin issues and by the time the poison ivy shows it ugly self, it is too late for us. My doctor said that they have found that the over the counter items don't work to get rid of it. But some of the itch things do work for that. However, for those of us whose rashes turn 'weepy' right away and spread...only steroids will do the trick. I think that I have mentioned the dvd series from Franklin Springs Family Media, "Homestead Blessings." The West Ladies have a wonderful set of dvd's that teach cooking, breadmaking, candlemaking, soapmaking, canning, sewing, quilting...the list goes on! Well, a month ago or so, I was digging through my stash and saw all the various shades of pink that I had. I though of this project and decided to try it. That day I got my cutting board (for sewing) out and measured out 5x5 inch squares in the various materials. 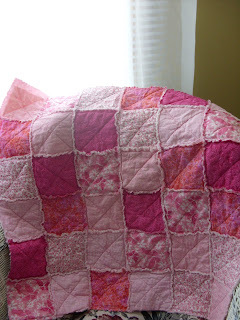 I had found 6 different patterns and was able to do 6 squares of each one, and set the project aside needing to find the batting and backing material.